예념미타도량참법은 아미타불을 지극한 마음으로 예배하면서 죄를 참회하고 극락왕생을 기원하는 불교의식의 절차를 수록한 책이다. 나무에 새겨 찍어낸 권6∼10의 5권을 1책으로 엮었다. 간행기록이 없어 정확한 연대는 알 수 없지만『예념미타도량참법』권1∼5, 6∼10(보물 제949호)과 비교해 보면 판의 형식 등이 동일하여 같은 판에서 찍어낸 것으로 보인다. 책 끝에 있는 김수온의 글을 통해 성종 5년(1474)에 세조비 자성대왕대비가 선대왕과 왕비들의 명복을 빌기 위해 간행한 것이며, 왕실과 고승 및 당시 일류 기술자들이 총동원되었음을 알 수 있다. 이 책에는 판을 새긴 사람의 이름이 써 있는 것이 보물 949호와 다르다. 이 책과 같이 판을 새긴 사람의 이름이 적혀있는 책이 더러 있는데, 그 책의 발문(跋文:책을 간행한 동기 등을 적은 글)을 통해 성종 5년의 원본을 연산군 9년(1503)에 해인사에서 원본과 가깝게 만들었음을 알 수 있다. 16세기 초 해인사에서 다시 찍어낸 불경으로 판의 새김이나 인쇄상태가 처음의 것에 비해 손색이 없다. 판을 새긴 사람의 이름이 그 무렵 책들의 간행연대를 추정하는 근거가 되며, 서지학과 불교 문화사 연구에 중요한 자료가 된다. These books record the procedure of a Buddhist ritual to repent of one’s sin and pray for one’s easy passage to the Pure Land while worshipping Amitabha Buddha. Printed from woodblocks, Volumes 6 to 10 are bound into one book. The exact publication date of this book is not known because of the absence of publication record. 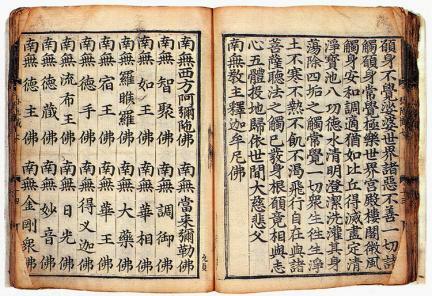 Nonetheless, it is believed to have been printed from the same woodblocks as Yenyeom mita doryang chambeop volumes 1-5, 6-10 (Treasure No. 949) because of the similarity between the two books in terms of the style of woodblocks. 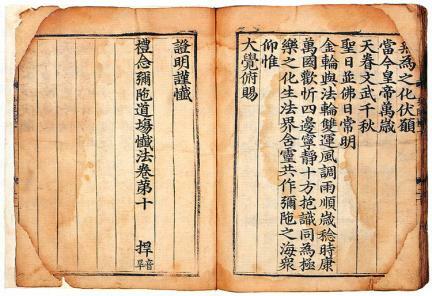 According to the record written by Kim Su-on at the end of the book, Queen Jeonghui, who was Queen Consort to King Sejo in the Joseon Dynasty, published the book in the 5th year of King Seongjong’s reign (1474) to pray for the repose of late Kings and Queens of the past; the best printing experts and respected monks were mobilized for the printing of the book at that time. The only difference between this book and Yenyeom mita doryang chambeop, which is designated as Treasure No. 949, is that this book has a record about engravers. There are a few books that have a record of the engravers like this book. According to the epilogue of those books, the second woodblocks were engraved at Haeinsa Temple in the 9th year of King Yeonsangun’s reign (1503) based on the original one, which had been engraved in the 5th year of the reign of King Seongjong of the Joseon Dynasty. 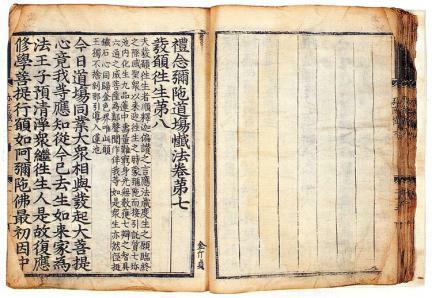 This book was printed with the second woodblocks at Haeinsa Temple in the early 16th century. Note, however, that the printing and engraving condition is as good as that of the first ones. This book is considered valuable since the record of engravers provides a clue in estimating the publication date of the books, which seem to have been published in the same period. It also provides important information in studying bibliography as well as the history of Buddhist culture in Korea.